(CNN) -- Scientists say a very rare find of some 20 fossilized pterodactyls has produced the first clear evidence of a controversial theory of evolution. 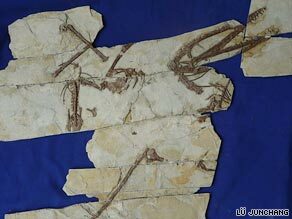 This image shows the fossilized skeleton of Darwinopterus which was found in north-east China earlier this year. The fossils were found in northeast China earlier this year, embedded in rock dating back 160 million years, and have been called "Darwinopterus" after the renowned naturalist Charles Darwin. The creature's discovery has astounded scientists because their age puts them within two recognized groups of pterodactyls -- primitive long-tailed forms and advanced short-tail forms -- and they display characteristics of both. The combination of features indicates that the primitive pterodactyls evolved relatively quickly, and that certain groups of features changed at the same time. Traditional evolutionary theory suggests that one feature -- a tail for instance -- would slowly evolve over time. "Darwinopterus came as quite a shock to us," said David Unwin, from the University of Leicester's School of Museum Studies, which identified the creature, along with researchers from the Geological Institute of Beijing. "We had always expected a gap-filler with typically intermediate features such as a moderately elongate tail -- neither long nor short -- but the strange thing about Darwinopterus is that it has a head and neck just like that of advanced pterosaurs, while the rest of the skeleton, including a very long tail, is identical to that of primitive forms," he said. By comparing the fossil with others from earlier and later periods, scientists have been able to sketch a rough timeline of the pterodactyl's progression. "The head and neck evolved first, followed later by the body, tail, wings and legs," Unwin said. The researchers say more study is needed to substantiate the idea of that evolution could occur relatively quickly, and that whole parts of a plant or animal's body could change at once. The fossils indicate Darwinopterus was about the size of a crow, with long jaws, sharp, pointed teeth and a flexible neck. It had "hawk-like" qualities, scientists say, which allowed the creature to kill and eat smaller, feathered dinosaurs which would later evolve into birds. Pterodactyls were prevalent during the Mesozoic Era between 220 and 65 million years ago. The research has been published in the "Proceedings of the Royal Society B: Biological Sciences."